YoYofficer - Oversized and Light Weight? Yes Please! 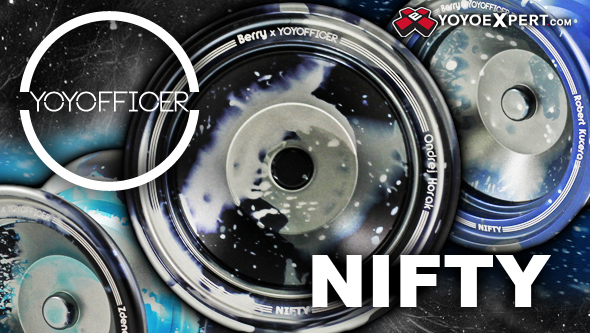 The Nifty is the first collaboration model from YOYOFFICER, they teamed up with Czech Republic brand Berry to create a really fun, really playable yo-yo and we couldn't be happier with the final product! The Berry x YOYOFFICER Nifty has such a unique feeling - With the oversized design and lightweight shape it is unlike anything YOYOFFICER has created int he past. Oversized and light weight? Yes! It may sound a little odd at first but the way these two companies were able to shape the weight distribution really pushes the Nifty to the next level! The Nifty is light on the string, moves as fast as you can push it, and with the heavy rim weighted stepped profile this yo-yo has stability for days. This yo-yo is really perfect for any style - Anything from tight technical tricks, swooping slacks, or huge horizontal combos - The Nifty can handle it all! Finished with a super smooth blasted finish and fitted with a grooved bearing and signature black YOYOFFICER pads the Nifty is ready to perform right out of the box!